A Mold Inspection is a visual inspection of all visible and accessible surfaces in an area or areas. It is important to document any visible mold, water damage, high humidity, active leaks, floods, wet building materials, musty odors, history of flooding and mold remediation. The information is then used to make the appropriate air and/or swab sample recommendations for each area. We will discuss everything that was observed during the inspection including the laboratory sample recommendations, why they were recommended, what information you get and how you can use that information. It is important that my clients understand as much as possible so that they can make their best decisions. The lab results and inspection information is then used to build your report/photo document and an approximate scope of work, if necessary. This mold stuff doesn't have to be a mysterious scary thing. When I'm finished you will have a working understanding of your situation. Inspection Rates are based on square footage and distance. Why do I need a Mold Inspection? Can't the remediation company just come in and take care of it? Yes they could. In my opinion it is very important to have an unbiased picture of what may or may not be going on. I don't want my clients to waste their money and time having too much or not enough work done. A certified mold inspection would document the affected areas for an appropriate scope of work. If mold remediation is necessary it is important to have your original mold inspector perform a Post Inspection of the work. This will insure that the work is complete and the area is ready for rebuilding. Before the containment is taken down. Before an encapsulant paint is applied to the surfaces. When there is no visible mold. All building materials are clean dry. When all of these conditions are met clearance air samples are taken. Mold spores are so small that thousands can fit on the tip of a ballpoint pen. Air sampling will provide you with facts not someone walking through and telling you that it looks fine. Taking care of a problem and having the documentation to back up how it was properly taken care of is gold. Keep this paperwork for your files, it will be invaluable in case you sell your home or building. 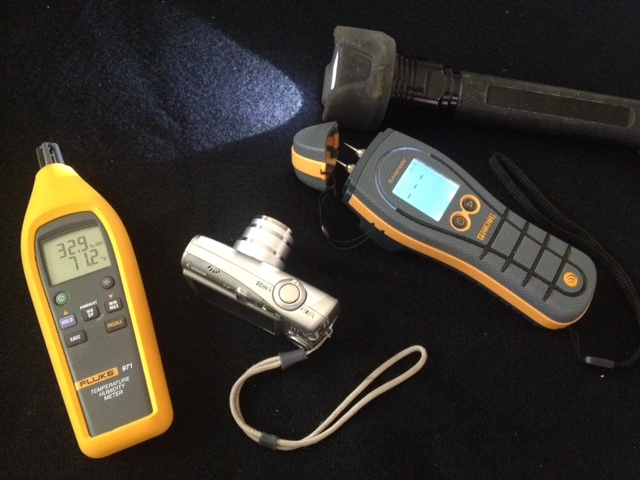 A Mold Inspector's 4 most important tools. *An inspector will have a variety of other tools including but not limited to ladders, air sampling equipment and sampling supplies. A thorough mold inspection is more than someone walking through a room, looking around and saying, Oh it's just fine, nothing to worry about. Or, there's mold everywhere, your house is ruined and it is going to cost you a lot of money. ​Know who you are hiring to inspect your property. It is important to "follow the trail" and inspect the adjoining areas. Did the water come from above, a roof leak? Better check the attic or room above. Did water run down to the room below? Maybe? Lets find out. 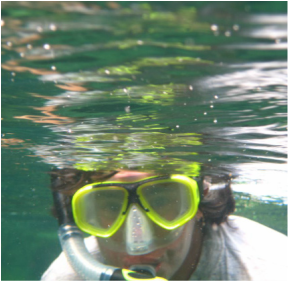 That is why it is important to check all of the adjoining areas, above, below and on all sides of an affected area. I have seen so many jobs that were incomplete and the client in essence, wasted their money. One example: I inspected a house where one room in the basement had previous remediation of mold. The clients were concerned about the remediation and had me in to inspect the work. The remediated room was perfect, it was a great job. I inspected the rest of the basement and found mold and water damage in the hall and the rooms on either side. A mold inspection before would have identified all of the areas needing work and the clients would have taken care of everything at once. Now they have wasted their time and money and have more work to do. ​I don't want anyone to waste their time or money.